The air-supported cover over our 100-foot community pool has collapsed three times. A Structures Unlimited Inc. diffuse-light-transmitting Pool Enclosure System is an ideal solution. The factory prefinished, corrosion-free, pre-engineered aluminum box beam and translucent sandwich panel building system meets all local and national building codes as well as OHSA fall-through requirements. Controlled daylight brightens the entire pool without glare or shadows. And interior reflectivity maximizes indirect lighting, saving on HVAC expenses. We love the fun provided at our splashpads, but we'd like to manage the volume of water used. Splashpads® are normally controlled by sequencing, which controls the amount of time the user interacts with the play features. 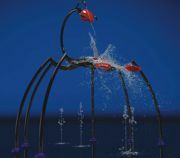 The Vortex Spider and Scorpion provide fun while still managing the volume of water consumed. Complete with jetspray activators, these enormous play structures come to life when users press the activators. Children learn the cause and effect of their actions. The legs of our picnic tables and benches are in good condition, but the wooden boards are rotting away and need replacement. The recycled plastic lumber used to create Perennial Park Products' full catalog of outdoor site furnishings is guaranteed to last a lifetime. This means the boards on your outdoor tables and benches will never crack, rot, splinter or fade. Plus, they're completely waterproof and resistant to insects, bacteria and permanent staining. Reapplying wood mulch annually is cost-prohibitive. Pinnacle Rubber Mulch has a 12-year warranty, and, unlike wood mulch, it will not decompose. Available in a variety of natural-looking colors, Pinnacle Rubber Mulch remains vibrant for years to come. This product eliminates the need for annual mulching, saving you time and money. In fact, you can save as much as 65 percent over wood mulch within five years. How can we create the safest playground for children and lessen injuries? More than 200,000 children are sent to the emergency room as a result of a fall on the playground each year, a majority due to surfacing that is not safe. By installing a loose-fill rubber mulch such as Rubberific Mulch® or NuPlay®, you can be assured that the safest surface available today will be protecting your children for many years to come. With the highest fall rating of any groundcover, recycled rubber mulch can protect our future from falls. We're looking for a greener choice for our playground's safety surface. Burke TurfTM is the perfect playground surfacing option for your park, recreation or school playground. BCI Burke combines rugged durability with remarkable softness and beauty. It's easy on the environment (100 percent recycled) and has the look of a fine-blade fescue or bluegrass lawn. But thanks to the latest turf technology, it's tough enough for high-use sports and playground areas as well. Clearing debris at our outdoor aquatic facility takes personnel time and uses up supplies. An Atria commercial enclosure allows you to welcome the nice weather in and keep the inclement debris and weather out. Not only allowing for year-round usage, an Atria commercial enclosure saves in debris removal and cuts chemical costs attributed to debris and rainwater dilution. A debris-free and year-round enclosure is ideal for commercial and recreational aquatic facilities. How can we be certain that our playground surfacing will meet the safety standards in the long term? Test reports supplied by the surfacing manufacturer should never be viewed as an indication of compliance. Always specify greater safety performance through lower HIC ratings. Always require post-installation field testing as a deliverable within the purchasing contract. For more information, e-mail info@sofsurfaces.com and request a free copy of the "5 things you should know about fall protection standards."